The National Board of Certified Counselors (NBCC) helps determine if professionals can be certified as National Certified Counselors (NCCs). Part of this certification process includes passing the National Counselor Exam (NCE). The NCE is also used by many states as part of their own credentialing process. The NCE is a four hour, paper and pencil based, multiple choice examination. It is given in April and October of every year at various locations around the United States. Prepare with our NCE Study Guide and Practice Questions. Print or eBook. Guaranteed to raise your score. Get started today! Prior to registering for the NCE, there are some eligibility requirements that should be met. These educational and work experience requirements can be found listed on the NBCC website. To apply for the NCE, an application packet (containing the application form) needs to be downloaded from the NBCC website, and printed. This application can then be filled out following the instructions in the application packet. Various forms, such as the Coursework Requirement form, endorsement forms, and the Verification of Experience form, must also be completed and returned with the application. These forms can be found in the application packet as well. In addition, all necessary fees must be paid for at the time of application. These fees are also outlined in the application packet. Once the application is complete, it must be mailed to the NBCC directly. Faxing the application to the NBCC is not acceptable, as original signatures must be present on the application received by the NBCC. NCE Flashcards. Proven NCE test flashcards raise your score on the NCE test. Guaranteed. Application deadlines for both the April and October test dates must be followed, and these are listed in the application packet. After NBCC receives an application, an applicant will get a form letter that confirms the receipt of the application. This letter will also provide information on how to check the status of applications online on the NBCC website. The application is then reviewed by the NBCC, and this process takes, on average, six to eight weeks. After the application review has been completed, applicants will receive a postcard or a letter in the mail indicating if they have been approved to take the NCE. If the application has been approved, the applicant is now officially registered to take the NCE. About two weeks before the examination date, applicants will receive an admission letter and directions to the exam location in the mail. The content on the NCE is general in nature, and it tests the abilities, skills, and knowledge that is necessary for a counselor to be effective. The exam is based on eight content areas and five work behaviors, for a total of 13 different domains. The five work behaviors tested on the NCE are: Fundamentals of Counseling, Assessment and Career Counseling, Group Counseling, Programmatic and Clinical Intervention, and Professional and Practice Issues. The exam itself consists of 200 multiple choice questions. Of these 200 questions, only 160 are scored and count towards the final score. Forty exam questions are being tested for use in future examinations and do not count towards the final test score. The test questions are selected from the NCE item pool, and different forms of the exam will contain different test questions. The exam is a paper and pencil based exam, and examinees have four hours to complete the exam. 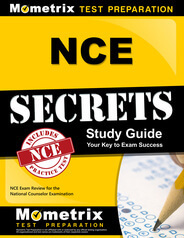 Explore our free NCE review provided by Mometrix. Check out our premium National Counselor Exam study guide to take your studying to the next level. If you benefit from these materials, just click the link below! 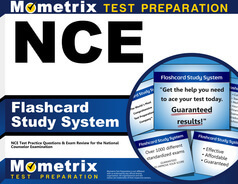 To compliment our NCE book, we also offer extensive flashcards for even more NCE exam prep help. We hope you enjoy our products! Your purchase helps us make more great, free NCE certification content for test-takers just like yourself. What is the national counseling exam? The National Counselor Examination is a multiple-choice exam that assesses the knowledge and skills needed to become an effective counselor. What is a passing score on NCE exam? Passing scores may differ slightly depending on which version of the exam you take. The exam is scored using a modified Angoff procedure. What is the NCE test for? The NCE test a requirement for counsel licensures in many states. What does NCE stand for in counseling? NCE stands for National Counselor Examination, which is given by the National Board for Certified Counselors. How much does it cost to take the National Counselor Exam? The examination fee for the NCE is $275. This is nonrefundable and nontransferable. How do you sign up for the NCE? To sign up for the NCE, you need to make a ProCounselor account using the NBCC website. Once your documentation is approved, you will be contacted about your exam via email. Out of the 200 test items on the NCE, only 160 items are scored. Therefore, the maximum possible score on the NCE is 160. The minimum passing score on the NCE is determined using a modified Angoff procedure. This procedure takes into account the possibility of answering each presented question correctly, and therefore, the minimum passing score will vary from exam form to exam form. Score reports are mailed to examinees within eight weeks of the exam date. These reports include several things. First, they include the number of correct answers for each of the 13 domains on the exam, as well as the total score. The total score is the sum of the correct responses, with the maximum total score being equal to 160. In addition, the score report also shows a group mean and standard deviation for each of the 13 domains and for the exam as a whole. And, finally, the score report shows the minimum passing score for that particular NCE form. If the examinee’s total score is equal to or greater than the minimum passing score, the examinee has passed the NCE. If the total score is less than the minimum passing score, the examinee has failed the NCE. Prior to taking the NCE, preparation for the exam is crucial. This preparation should start with a careful review of the NCE content and structure. The 13 domains on the exam should provide a starting point for areas in which to review. In addition, sample questions for the NCE can be found on the NBCC website, and taking as many sample questions and/or sample tests as possible is also beneficial. During the examination, careful management of time is very important. All questions on the examination should be answered, and leaving answers blank can have an adverse affect on the total score. If an answer is not known, it can be marked and revisited later, and an educated guess is always better than leaving an answer blank. Also, because the answer sheets are machine-scored, it is important to be very clear when marking answers. Often, answers that are not clearly marked on the answer sheet will be marked as incorrect by the scoring equipment. Therefore, being careful when marking answers is crucial to achieving success on the NCE.